I’m one of the guest authors at the Stoke Newington Literary Festival and will be on a panel there at 13.00pm, this Sunday 8th June at the Abney Public Hall in London’s lovely Stoke Newington (the veritable Riviera of North London?). When it comes to science fiction and fantasy, many of us blur the lines between the two. In fact, most authors do the same – a crossover of genres often occurs throughout their careers, sometimes even within the same book! We talk to four of the leading writers in this area – Stephen Hunt, Ben Aaronovitch, Radio 4’s Mitch Benn and Jon Wallace – about what it means to be a genre writer and how they manage to haggle with the boundaries. Hosted by Gollancz Associate Publisher, Simon Spanton. 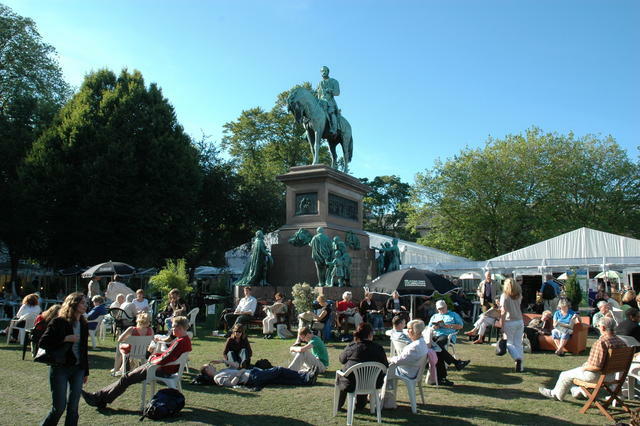 And here’s what the Edinburgh Book Festival looks like . . .
« Fantasy novel ‘In Dark Service’ is 87% off!